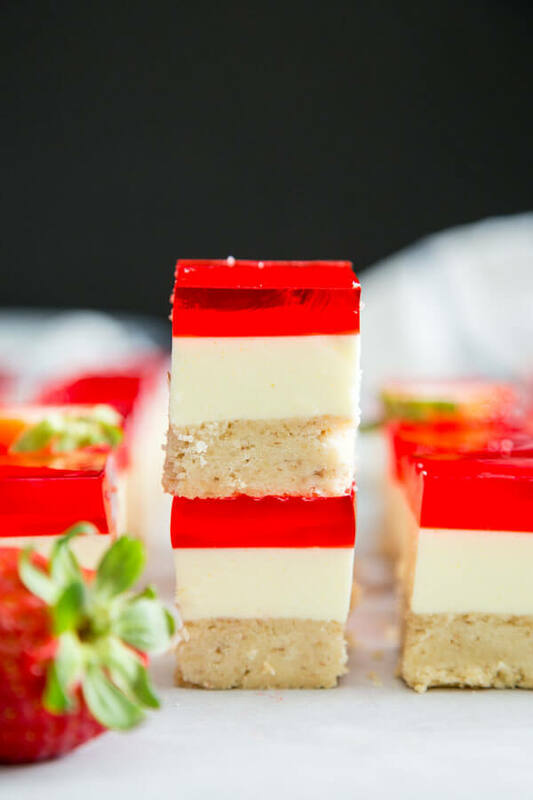 This Strawberry Jello Dessert Bars recipe is a hybrid of a strawberry pretzel salad and a strawberry jello cheesecake with a walnut shortbread crust. It is easy to make and is a great shareable dessert to bring to potlucks and big family gatherings. 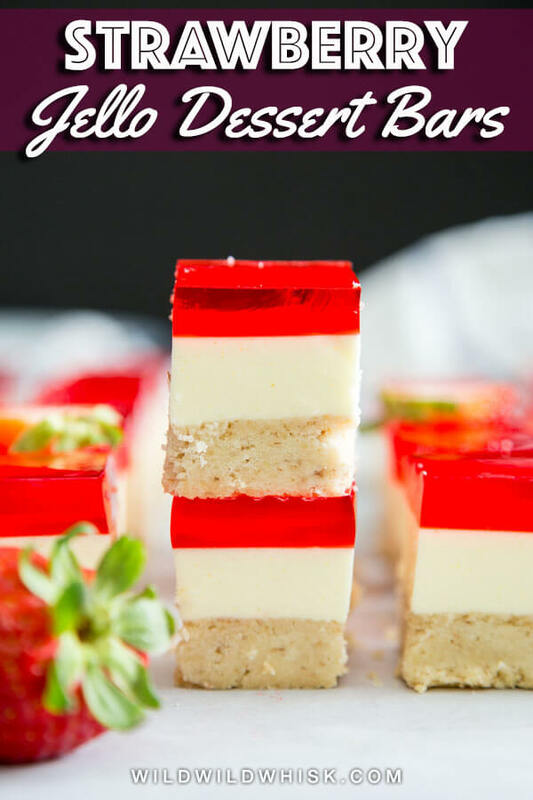 These Strawberry Jello Dessert Bars were Ryan’s grandma’s signature jello desserts. She used to make this recipe whenever we go off to a family gathering, every single time without fail. Now, it has become one of my favorite recipes to make whenever we go to a party, albeit slightly time consuming due the three layers. But really though, most of the time, you’re just waiting for it to cool or set, and not actually doing any hard work. 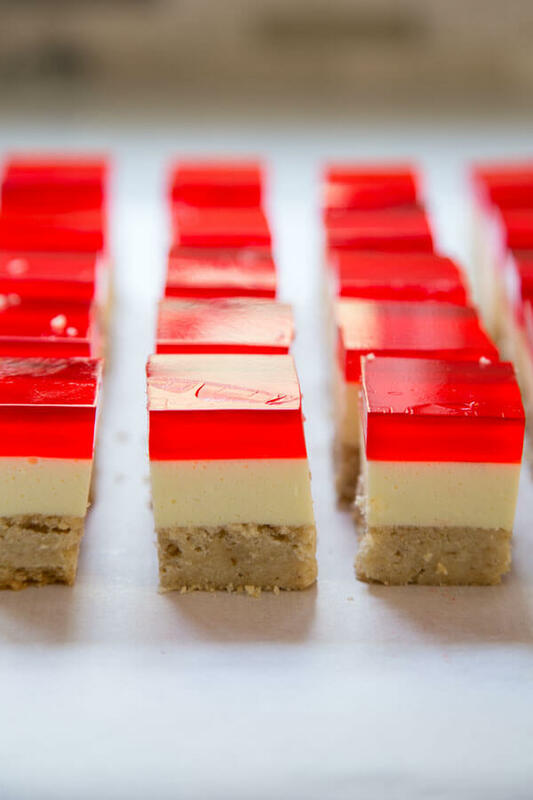 These Strawberry Jello Dessert Bars are slightly similar to a strawberry pretzel dessert. 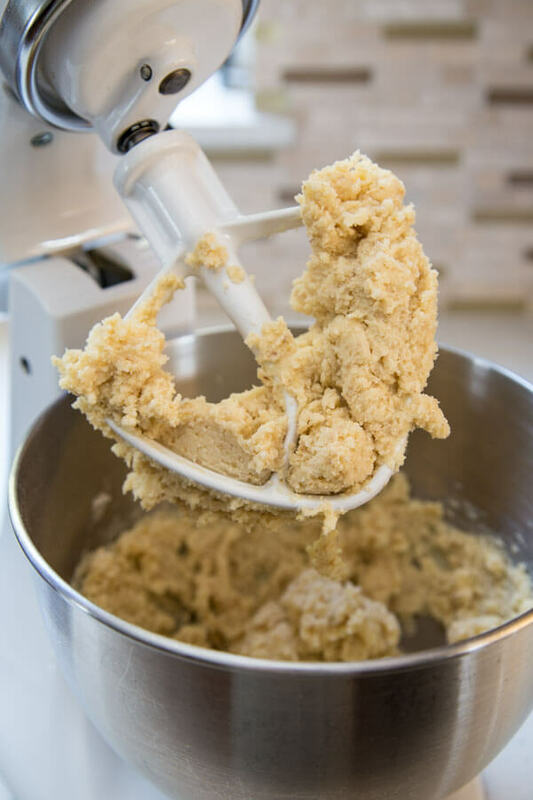 But instead of the pretzel crust, we have a nutty and buttery walnut shortbread crust made with finely chopped walnut mixed with flour, butter and sugar. Ryan’s grandma used to chop the walnut by hand, oh so fine. But modern technology has allowed me to make this mush easier with the use of a food processor. 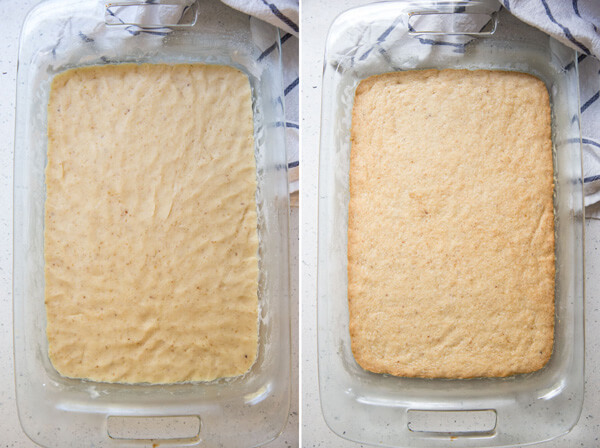 The crust is pressed into the baking dish and baked until lightly brown. It then needs to be cooled down completely before the layering happen. Be sure to butter and flour your baking dish so the crust can come out easily at the end. You can brush melted butter on your baking dish or rub a piece of butter with your fingers on the baking dish. Then sprinkle flour enough to cover the surface of the baking dish and discard the excess by inverting the baking dish and tapping it away. The cheesecake layer is made with a mixture of cream cheese, whipped cream and lemon Jello. Whipped cream is usually made when it is ice cold. This will make the cream cheese mixture pretty cold as well. This is where you want to be careful and not let the lemon gelatin mixture gets too cold. 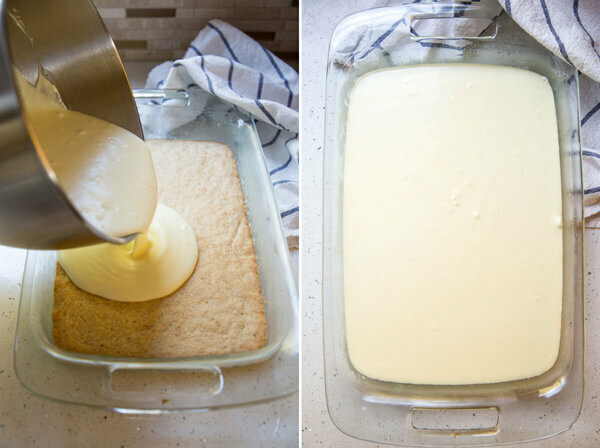 If you pour a cold gelatin mixture into a cold cream cheese mixture, the gelatin will coagulate quickly creating hard chunks, so be sure to work with a slightly warm lemon gelatin at this stage. Pour the creamy cheesy lemony mixture on top of the cooled crust and refrigerate it until completely set. 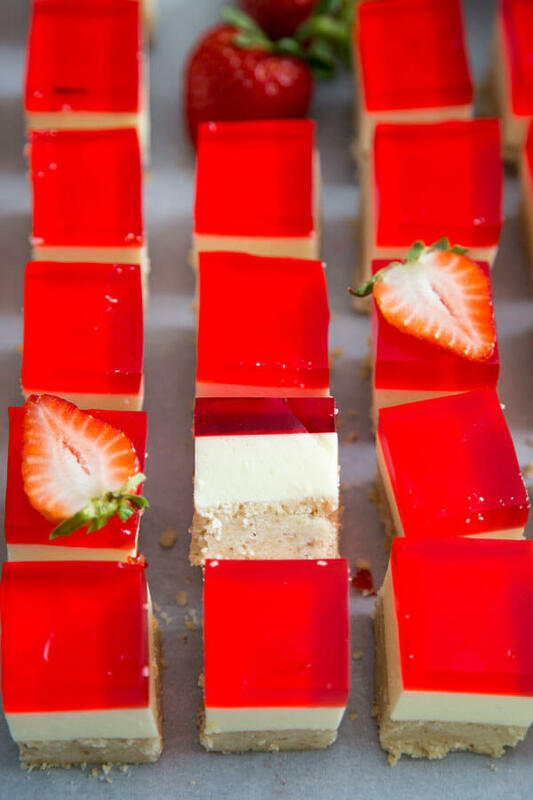 As for the strawberry Jello layer, you want to work with a completely cooled liquid so you don’t melt the cheesecake layer when you pour over it. 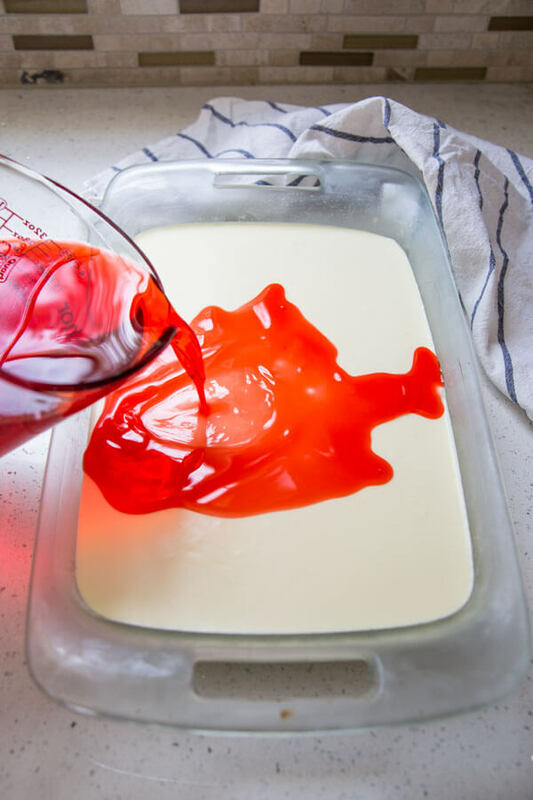 The best way to add the strawberry Jello is to use a measuring cup or something with a spout, and pour it into the baking dish while it remains inside your refrigerator. Trust me on this because transferring a liquid filled baking dish back into the fridge is no easy feat. You can use a rectangular metal cake pan for this recipe if you want to make all the edges straight. The glass baking dish usually has slanted sides or curved transition between the sides and the bottom, so the edge pieces won’t come out completely square. I prefer the glass baking dish just because you’ll need to cut into it with a knife and you can scratch up your metal cake pan really good. I’ve made these so many times, and with plenty different Jello flavors: grape, orange, blueberry, raspberry. But I always come back to this original strawberry flavor. I have always been curious where Ryan’s grandma got this recipe. Over the past years, we have spent a lot of time traveling back and forth to Hawaii, and we found similar treats, with strawberry and lilikoi (passion fruit) flavor, at the bakeries over there. 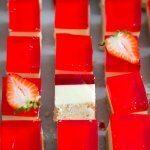 So I’m guessing these Strawberry Jello Dessert Bars are part Hawaiian. No wonder I love them so much! This recipe was originally published on 7/30/2014. The recipe has been updated to with more streamlined directions. The post has also been updated with extra tips and step by step photos to help you in the kitchen. Preheat oven to 350°F. Butter and flour a 9”x13” baking dish or cake pan and set aside. 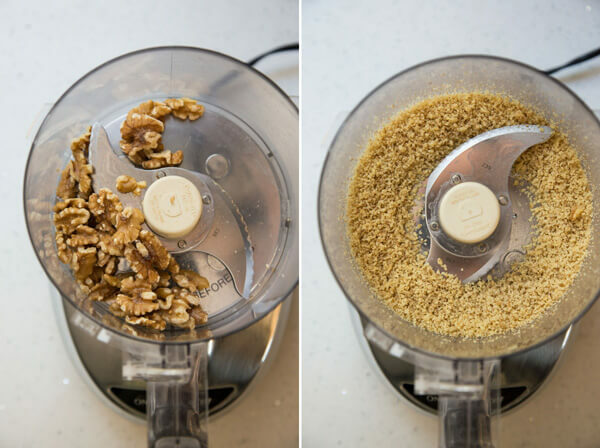 Finely chop the walnut in a food processor. Add chopped walnut and flour in a small mixing bowl and whisk together until evenly distributed. Cream softened butter and sugar in the stand mixer bowl with the paddle attachment. Add the flour and walnut mixture, and stir until combined. Transfer the dough to the prepared baking dish, spread and flatten with the tip of your fingers to create the bottom crust layer. Bake 30 minutes until lightly brown. Allow to cool completely on a wire rack for about 2 hours. Add 1/4 cup of room temperature water to large glass measuring cup. Sprinkle plain gelatin over the water and allow it to bloom for 1 minute, making sure all of the powder gelatin is soaked in water. Boil water in the mean time. After the plain gelatin has bloomed, add 3/4 cup of boiling water and the lemon Jello to the measuring cup. Stir until completely dissolve and set aside to cool down slightly. You’ll want to start working on the cream cheese mixture when the lemon gelatin is still slightly warm. 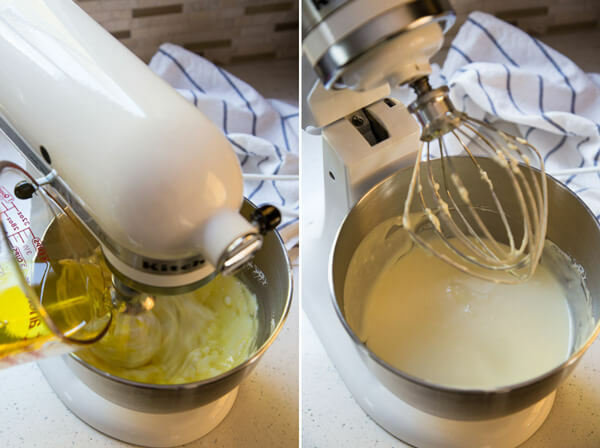 In a stand mixer bowl, whip the heavy whipping cream with the whisk attachment on medium-high speed to stiff peak, transfer to a smaller bowl and set aside. In the same stand mixer bowl, cream sugar and cream cheese together with the whisk attachment on medium speed. Add the whipped cream back into the bowl and stir to mix the cream cheese and whipped cream together. Scrape the side and bottom of the bowl with a spatula to ensure thorough mixing. With the mixer on stir, pour the slightly warm lemon gelatin into the cream mixture and mix until all the liquid has incorporated completely. Increase speed to low and mix until completely smooth. Scrape the side and bottom of the bowl with a spatula as necessary. Pour this mixture on top of the cool crust and chill in the refrigerator for about 2 hours or until completely set. After the plain gelatin has bloomed, add 2 3/4 cup of boiling water and the strawberry Jello to the measuring cup. Stir until completely dissolve. Set aside to cool to room temperature completely and pour over the already set middle cheesecake layer. Chill in the refrigerator for about 2 hours or until completely set. Cut into squares for serving. For the middle cheesecake layer, the whipped cream is usually very cold which makes the cream cheese mixture pretty cold. If the lemon gelatin mixture is also cold, when poured in to a cold cream cheese mixture, the gelatin will coagulate quickly creating hard chunks, so it’s always good to work with a slightly warm lemon gelatin. Calories are calculated based on 55 small servings per batch. Oh my gosh, my favorite great aunt used to make this! I found your site on Zite. Everything looks so great. Thank you for subbing for Cool Whip. I do the same. Can’t wait to try the apple pie scones and other great recipes you post. So glad to have found you! Thanks for visiting Patty! It makes me so happy to see someone as excited about a recipe as I am! 🙂 Glad to have you here!